Ron was born and raised in Gilbert Plains, Manitoba. During World War II, he served in the Royal Canadian Navy on Atlantic Convoy duty on the HMCS Saskatoon, followed by service in the Pacific on the HMCS Uganda. After the war Ron furthered his education at the University of Manitoba studying Agriculture. In 1948 he married Doreen, and they had two sons, Rod and Randy, both of Calgary. Ron is survived by Doreen; his sons, Rod (Catherine), and Randy; his grandson, Jeff (Andrea); and his great grandchildren, Addison and Jack, of Vancouver. He is also survived by Catherine’s son, Ryan; her daughter, Lindsay (Mike); and Lindsay’s two children, Nicholas and Annalise. Ron joined Cockshutt Farm Equipment and worked in Saskatoon and Yorkton, Saskatchewan; Winnipeg, Manitoba; and Brantford, Ontario. 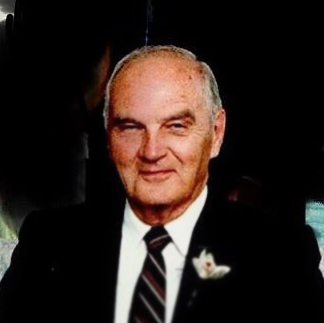 In 1961 Ron and his family moved to Calgary where he worked as a Sales Manager for Allied Farm Equipment. At retirement he was General Manager of the Western Division of Allied Farm Equipment (Canada) Ltd. and was a past president of the Alberta Wholesale Implement Association. At Ron’s request, no service will be held, however, interment will occur at a later date in Gilbert Plains, Manitoba.